Reese’s is like someone you dated five years ago and haven’t thought about in a while. But then you’re out on a Friday night, drinking a cocktail, and in walks your ex. And you’re floored. They got a haircut, their clothes are extraordinarily flattering in a way they never were when you dated, and they also have a brand-new peanut butter shell! Oh, oops. 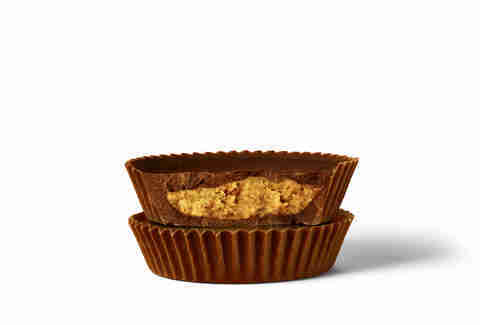 Ok, that last part is just what happened to the new Reese’s, which is stepping out onto the scene with two killer new looks to join the recently released Thins: Peanut Butter Lovers and Chocolate Lovers Cups, which will be available to the masses in April. Whether you’re a peanut butter or a chocolate person (or both! 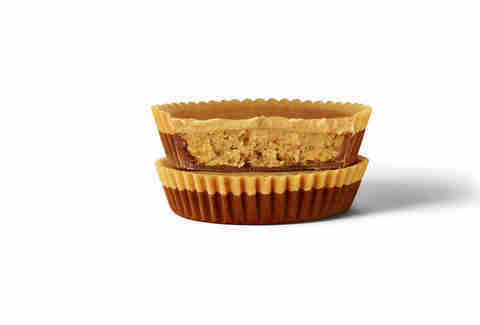 ), you’re probably going to want to try one of these new Reese’s. We ate them both, and are here to tell you if it’s worth your time. I took a bite of that original Reese’s cup before trying the new Chocolate Lovers, and let me tell you… there’s not much of a difference. At first bite, you might think, “I sure could use a lot more chocolate in this Chocolate Lovers Reese’s,” but you’ve gotta be patient. Pay attention to what you’re eating! I’m a proponent of everyone being more mindful, and eating this will unintentionally force you to determine whether it has more chocolate than the original. It does, but it’s not obvious. I did taste some darker milk chocolate notes while I was chewing it, and a little bit of dark chocolate flavor in the finish. But if you gave 100 people a blind taste-test and asked them if anything felt different about this Reese’s, I think only about 25% would identify a “darker milk chocolate” as the key. To give the company’s slogan a bit of a twist, “there’s no wrong way to make a Reese’s,” but if Hershey’s wants to produce a true Chocolate Lovers cup, they’d be better off filling the chocolate shell with chocolate-infused peanut butter. The smell is intoxicating right off the bat -- opening a pack of these reminds me of opening a jar of Reese’s Peanut Butter. It looks unusual, too -- it’s the shape of a regular Peanut Butter Cup, but it’s as if someone in the factory forgot to add the outer chocolate shell to a Reese’s. But that’s how it’s supposed to be! It’s like the shell surrounding the peanut butter is Two-Face from Batman -- the bottom half is the regular face (a chocolate shell) and the top half is disfigured because of an untimely fall into an open pool of toxic sludge (a new peanut butter shell!). After one bite, all I can think is, “I need a glass of water.” There is quite a bit of peanut butter flooding my tastebuds. 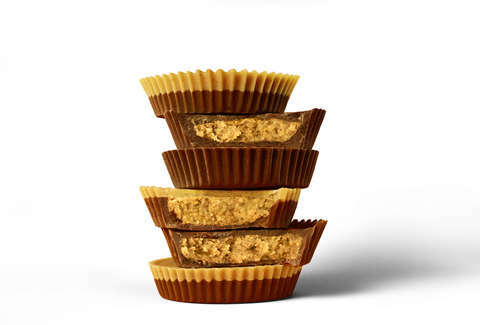 The chocolate from the bottom half of the shell offers a bit of chocolate nuance to the proceedings, but they might as well have called this an all-peanut butter Reese’s. Which they should! Reese’s, you listening? That said, this new Peanut Butter Lovers cup is delicious for everyone, but it’s ideal for the type of person who eats peanut butter straight from the jar. Chocolate and peanut butter is an unassailable combination, but peanut butter with only dash of chocolate is a winner, too. For anyone who loves Reese’s and peanut butter, you’re going to have a new favorite snack in the candy aisle. Get ready to snap these up when they hit stores in April.